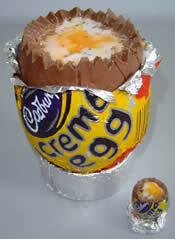 Then our rookie error was made. As first time pimpers we think this is fully excusable. Upon making the buttercream- mixing icing sugar and butter- we dolloped this straight onto the top sponge in order to make the characteristic fondant fancy mound. 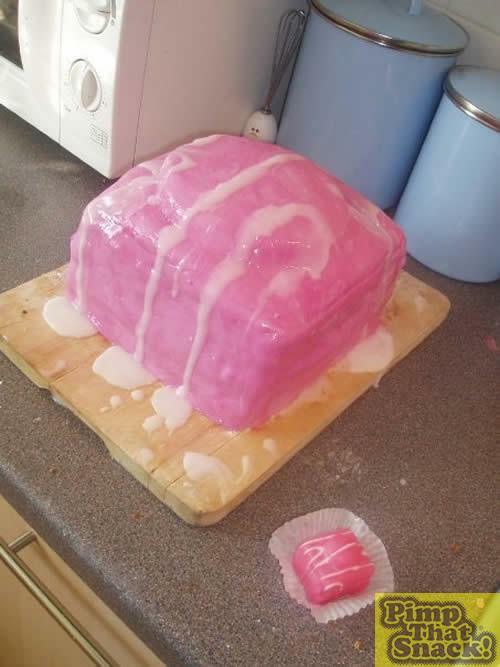 However, we decided that when we placed the icing- soon to be produced- over the buttercream it could crush it and destroy our delicate moulded mound. We therefore took the butterscotch off and decided to ice the fancy first. 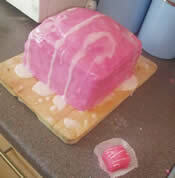 We squashed the prepacked icing and worked the pink food colouring in. This was messy and fairly taxing. 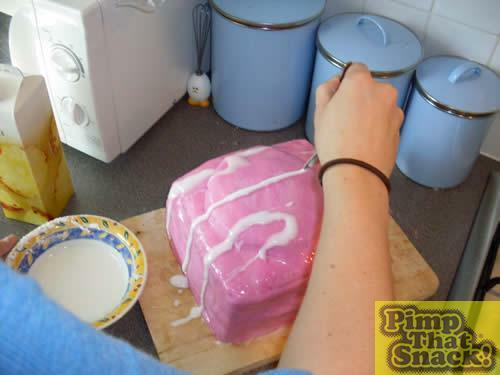 We then needed to roll the icing. Lacking a rolling pin we used the cardboard centre from a roll of tin foil. Crafty- and effective. 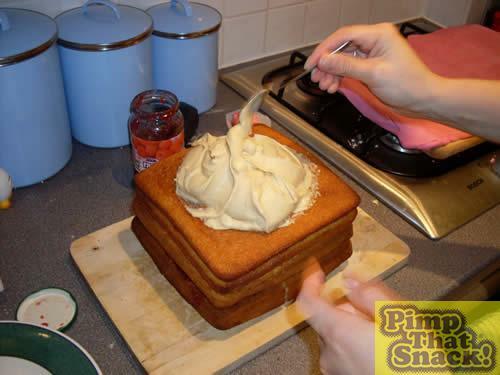 Next we iced the cake- we placed squares of icing over the top and sides of the sponge. 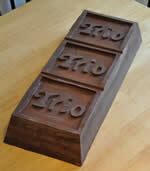 We joined the edges by wetting them with water and moulding together. We had the square base- all iced and looking lovely. We placed the butterscotch on top and then some very thin icing over the mound making sure we smoothly applied the icing (meaning that the mound remained intact and in shape). We wetted the icing over the mound and joined it to the rest of the fancy. 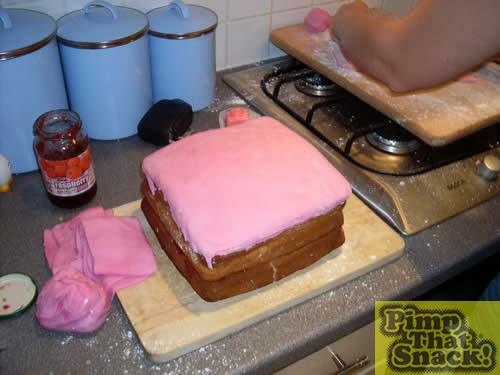 The fondant fancy was now truly taking shape. After a brief rest, to restore full pimping skills, we finished the fondant fancy. To make the characteristic white stripes we mixed icing sugar and water. Getting the consistency of this is key. Not a lot of water is required or else, as we found to our detriment, you will end up with a runny disaster on your hands. We dribbled the icing over the fancy. Done (this last bit made it sound easy- we faffed around for ages first of all smoothing the icing, joining edges properly, redoing the white stripes- when sober it appears a lot less impressive than 10 hours previously). 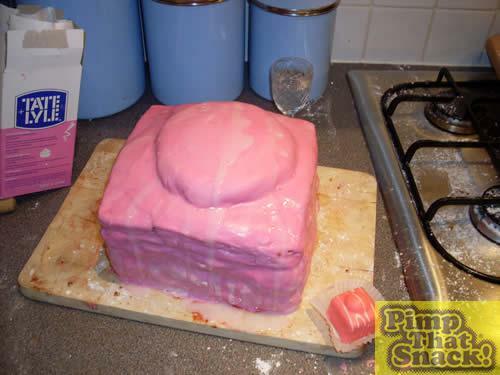 The fondant fancy was incredibly big, tasty and got a lot of attention- from friends, family, work colleagues, and the driver on the national express coach when I took one half back home with me on the coach.